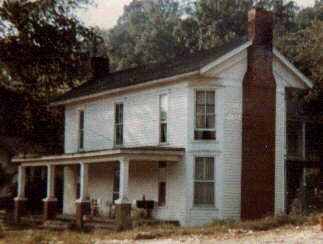 The second home of Richard Nathaniel Lyons, Senior. The home was built in about 1892 by Mr. Lyons, a carpenter and stone mason in the booming town of Beattyville, where the Kentucky River forms. The Lyons family moved from the town of Proctor, located across the Kentucky River, where he had lived since shortly after the Civil War. The home has Victorian accents with the ends of the frontage having three-sides with a chimney. The front room and parlor were on the first level, and there were bedrooms upstairs. The rear of the home had a two-story wing that included a formal dining room. The kitchen was located at the end of the wing. There were more more bedrooms on the second floor of the wing. The home overlooked the Swan Day Lumber Yard -- one of the largest in Eastern Kentucky . It burned in December 2012; it was one of the older homes in Beattyville.